Thinking about love and hate the day after Charlottesville’s tragic events. Have you ever been on the blunt end of being hated? Being hated is an incredibly damaging and impactful thing. In our world today, I’m sure many of us have felt it at some point, to some degree or another. It makes you turn inward or, perhaps, away from the hater and even from others. Perhaps, the hated person turns to others who have felt the same hate, thus creating a group who has felt hated. Then, in a cauldron of emotions, they foster more hate, largely it would seem, to make themselves feel accepted by other haters. Then after a while, hating turns into something deeper. It becomes an aspect of one’s identity. The ‘hated,’ turned ‘hater’ embraces symbols of their brand of hatred. In today’s culture this is not just a lapel pin, an emblem on a necklace or a bracelet, it is often ink in the canvas of one’s skin or a flag carried down a street or planted in one’s lawn to provoke others. Thus deepening the identity connection in a more practical and significant manner. Identity is an extremely important aspect to who we are, who we associate with and who we love, or hate. The tragic events here in Charlottesville yesterday are a sad symbol of hated haters gathering together to face off against others hated haters. In the name of free speech, or of justice, or these or those rights, or, well… the blank may be filled in. Where is the dialogue? Where is the conversation? It’s certainly not in the media. They have ALL CHOSEN SIDES. I have felt hate. I have found myself hated while abroad because I am an American, deep, angry hate. I have felt hate because I was not X but was in a place only for those who were X. I have even been called a hater (and will likely be called such again) on this very blog and elsewhere because I refused to tow a certain party line. I know the emotions that one feels when the target of such. Emotions demand decisions. One decides to love just as one decides to hate. It is possible to decide to respond in love. A wise pastor once told the story of being a hater against those who oppressed him and others. He was an oppressed person himself as a member of a weak ethnic group who was moved around by a much stronger government. Uprooted by the oppressor, he had to make a new life elsewhere, because he was part of the hated other. So he does. He decided to obey and to love instead of hate. He was hated for that too. 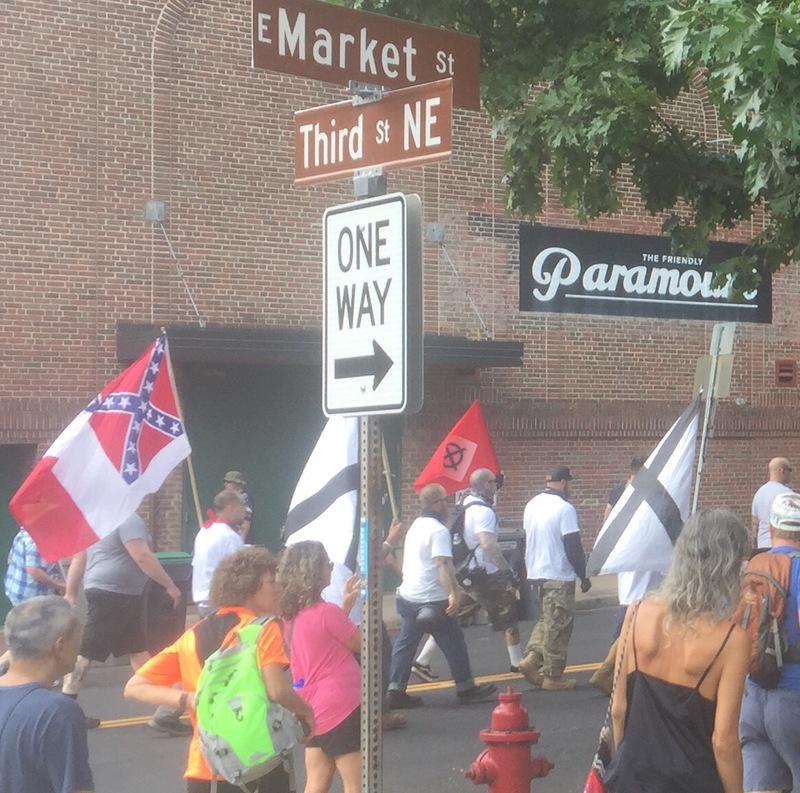 There was a shortage of love in the several block peremeter around the statue yesterday when we were in downtown Charlottesville and saw this parade of hate. Today there’s a shortage of love among the political commentators who are responding the to shortage of love coming from the White House. There are a lot of people deciding to hate today. May our hearts learn to forgive and love rather than perpetuate more hate, hating and haters. Yes, we must stand against evil. No, I’m not naive enough to think these haters minds will be changed. They are deeply stained with hate, especially in the formation they arrived in. They marched wearing helmets, bearing shields and carrying sticks just the right size for close quarter conflict. Their hate wanted a fight, and they got one. Pepper spray could be smelled where we stood just one block away. We could see the altercations begin. Their hate was hungry and it was fed. Was the response to such hate the wise and prudent answer? When we feel the need to respond, we should do so, but without matching evil with evil, hate with hate. Rather, meet hate with love. Pray for your enemy, for those who hate, that they may meet Love, in the person of Jesus who came to bring peace. This is what scores of people did in several churches yesterday. Indeed, perhaps their love, shown in prayer was more important than we will ever know. Because the parade of hate we watched walk into the hotspot was early. The demonstration was declared unlawful and the protests began to disburse. Had this chain of events not happened and the cauldron of hate boiled hotter, even more lives may have been lost and more injuries happened. Indeed, we may surmise that the prayers in those churches and among the rest of us, in homes, cars or on the streets nearby were answered with a quicker dispersal than may have been. The loss of three lives and the serious injuries of many others notwithstanding, for their families we all should pray, those who can, should reach out. But one thing I’d bet is that those three souls would now want love and reconciliation to be the result of their tragic and senseless deaths. May a reminder to love be a legacy from yesterday. We can begin loving, very practically by refusing to hate and admonish on social media. Share love instead. Hopefully it will be more infectious than hate. Well said Tom! Thank you! Subject: [New post] Thinking about love and hate the day after Charlottesville’s tragic events.